Editor's note: Part 1 can be read here. 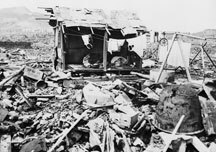 At Okinawa, "Bock's Car" and its escorts refueled, repaired, and reported to their superiors. They took off after two hours and returned to Tinian, at 10:25 p.m., 20 hours after takeoff. Beahan, forgetting that the day was his 27th birthday, went to bed. Everyone else was too tired to talk. In Tokyo, there was nothing to do but talk. The Supreme Council for the Direction of the War had met all morning, discussing the latest bad news: the Soviet Union declaring war on Japan and invading Manchuria. One-and-a-half million Soviet troops, 26,000 guns, 5,500 tanks, and 3,900 planes were thundering into Manchuria. Against that, Japan had 1 million men, 5,360 guns, 1,155 tanks, and 1,800 planes � most of them with no fuel. Many of the men were trained as "human bullets," to hurl themselves at Soviet T-34 tanks. The Kwantung Army was "hopeless," and the Manchukuo puppet army's men were tearing off their fancy uniforms and the five-colored stars on their hats as fast as they could. The generals, wearing their jeweled samurai swords, insisted that the war had to go on. Honor and Bushido code demanded that Japan fight to the last Japanese. The civilians, however, which included Navy Minister Admiral Mitsumasa Yonai � the Navy officers had more overseas training, which gave them a wider perspective on the world � could read ledger books and look into the faces of their exhausted and starving citizens and see that further fighting only meant the death of Japan's 75 million people and destruction of her islands. At issue was the Allied Potsdam Declaration, demanding Japan's surrender. The military would not accept it, unless there were four conditions, which included no occupying forces in Japan, Japan disarm itself, and no war crimes trials ... and preservation of the Emperor. The peace faction was prepared to accept the Declaration, as long as the monarchy was preserved, foreign troops and all. 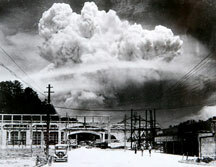 The deadlock was broken when the news of Nagasaki came to the meeting in the bunker near the Imperial Palace. The Hiroshima bomb was not a one-shot weapon. The Americans had at least two. And if they had two, and used them, they likely had more, and could and would use them. More Japanese cities would die like Hiroshima and Nagasaki, without a single invader's boot stepping onto the sacred soil of Dai Nippon. The two sides argued and bickered. The civilians worried about a leftist revolution by the masses. The military denounced Soviet mediation efforts as fakes. 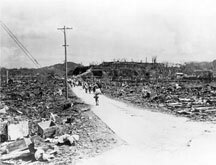 The civilians discussed the dreadful destruction of Nagasaki. The generals said that white clothing and concrete buildings would protect the people. But Premier Kantaro Suzuki, deaf in one ear, wrinkled and moustached, a peace-time cigar smoker, and full-time sake drinker who often fell asleep in meetings, held a trump card. That morning he had gone to the Imperial Palace and discussed the situation with Emperor Hirohito. They agreed that time was running out and the Allied terms had to be accepted. To do so, the Emperor would have to intervene in the Supreme Council. At midnight, the Divine Ruler, summoned the Supreme Council to the Imperial air raid shelter, a bunker on the Imperial Palace's property, to make the final decision. Hirohito was no longer going to be the puppet ruler. Nagasaki had tipped the scale. In the sweltering bunker, both sides formally dressed � uniforms for the generals, suits for the civilians � Japan's leaders hashed it out once more. The generals insisted there was "enough determination in the armed forces to wage a decisive battle in the homeland." Baron Hiranuma, speaking for the peace faction, snarled, "You said you had the means to continue the war but air raids come now every night and day. Do you have the means to defend against the atom bomb? I wonder." Gen. Yoshijiro Umezu mumbled that "proper anti-aircraft measures" would be taken against the B-29s. The civilians grilled the generals about the state of Japan's defenses. An invasion was due at any time. The generals and admirals were full of fight. Now an odd wrinkle entered the situation. The Japanese had captured an American P-51 pilot, Lt. Marcus McDilda, right after Hiroshima. Operating on the theory that one American would know the great plans of all of America's fighting arms, Japanese intelligence officers interrogated McDilda about the atomic bomb in Osaka, after marching him blindfolded through the city's streets, where angry citizens punched him as he staggered along. At the Kempei Tai office in Osaka, more professional torturers went to work, beating McDilda repeatedly. He gave them lies about the P-51's capabilities, and they seemed to accept those. Then they started grilling him on the atomic bomb. McDilda said he didn't know anything. The Japanese beat him some more, then tossed him in a cell. Late that night, a general came in and jabbed his samurai sword in the American's face, on an open sore. "If you don't tell me about the bomb, I'll personally cut off your head," the general said, then stalked from the room. Facing more beatings and not knowing more than Florida high school chemistry, McDilda made up some foolery about how the A-bomb worked. That impressed his captors. Then they asked the inevitable next question: What's the next target? McDilda decided to name the cities the Japanese loved the most. "I believe Kyoto and Tokyo. Tokyo is supposed to be bombed in the next few days." The interrogators asked for more details, but McDilda fell back on his earlier lies. 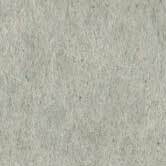 But the interrogators had what they thought they wanted, and they gave that information to their bosses in Tokyo, and it went up to the Supreme War Council. Because of McDilda's lies, Japan's supreme leaders now wrangled about the possibility of the Americans dropping an A-bomb on their nation's capital. Could Tokyo be defended? Of course, the generals said. The capital city was fully prepared. But when Hiranuma asked Umezu about the state of the defenses around Tokyo, Umezu admitted that delays in producing weapons in factories meant that the division guarding the capital would not be ready for action until Sept. 15 � more than a month away. Hiranuma snarled, "How on earth can you believe it is still possible to continue the war under existing conditions?" The generals couldn't answer. And this was in front of the emperor himself. At 2 a.m., with the bigshots unable to make a decision, Suzuki said, "I believe that everyone has fully expressed his opinion but I regret that we did not come to an agreement. As it is a matter of great importance, there is no way left but to rely on the decision of His Imperial Majesty." Addressing Hirohito, Suzuki said, "Your Imperial Decision is requested as to which proposal should be adopted, the foreign minister's (Potsdam) or the one with the four conditions." The generals had been trumped. Everyone stiffened to attention. The emperor rose, and said, "I agree with the foreign minister's plan. I have given serious thought to the situation prevailing at home and abroad and have concluded that continuing the war can only mean destruction for the nation and a prolongation of bloodshed and cruelty in the world." He continued, finishing up, "It goes without saying that it is unbearable for me to see the brave and loyal fighting men of Japan disarmed. It is equally unbearable that others who have rendered me devoted service should now be punished as instigators of war. Nevertheless, the time has come when we must bear the unbearable." There was absolute silence in the bunker. "When I think of the feelings of my Imperial Grandfather, Emperor Meiji, at the time of the Triple Intervention, I cannot but swallow my tears and sanction the proposal to accept the Allied Proclamation on the basis outlined by the foreign minister." The Emperor didn't wait for a reaction. He rose as his aide opened the door, walked out, and was gone. Nobody moved. Finally Suzuki rose, and said quietly, "His Majesty's decision should be made the decision of this conference as well." Nobody disagreed. The meeting was over. So, for all intents and purposes, was the Second World War. It was 3 a.m. Aug. 10, 1945. At 7:33 a.m., the Foreign Ministry's radio operators began sending a coded message to the Japanese Embassies in Sweden and Switzerland, to transmit to the Allied capitals, accepting the Allied terms. There was still some shooting and shouting left. The war would not end officially until Aug. 14, after an attempted coup to overthrow the emperor, and the surrender was signed on Sept. 2, but Hirohito's decision, pushed by the weight of Nagasaki, ended the war. Wars end formally with surrenders, armistices, and treaty signings, where diplomats in tails and generals in Class A uniforms and Sam Browne belts sign impressive, framed documents decorated with seals. Wars actually never really end. 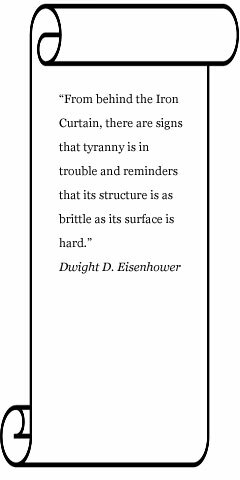 They sputter out over time, as the survivors and veterans slowly die off. In Nagasaki, the dying began right away, as doctors and scientists discovered what radiation really did to people who were exposed to it. Scientists and specialists fanned out across Nagasaki to study the impact of Fat Man, and came back with frightening reports and images. They didn't have to look too hard. There were more dead people than living in Nagasaki, and the living could barely care for the dying. After a month, everybody who remained was used to the corpses lying everywhere, blasted buildings, holes full of skeletons, and the endless stench of ruins. Three of the American uniformed visitors who went through Nagasaki's ruins were Chuck Sweeney, Don Albury and Kermit Beahan, the men who had delivered Fat Man and caused the destruction. They came with the first American medical team to enter the city, feeling uneasy. The night before, at his lodging in nearby Mogi, Sweeney had gone to bed with his pistol and belt hanging from the bedpost. He'd never done that before in his life. Sweeney, Albury and Beahan found that just over a month after their attack, bodies lay strewn everywhere, skulls along the sides of the cleared roads, and a massive stench made it hard to breathe. They found a medical center, whose main building was standing, interior gutted. In the blackened rooms, skeletons lay in the beds. Another skeleton lay on an operating table, surrounded by the bones of the doctors and nurses who had been operating on him when Fat Man detonated. The trio also saw living people, most of them exhausted from radiation sickness that was tearing apart their white blood cells and weakening them to death. Balding, burned, and burnt-out, they squatted forlornly in lean-tos they had thrown up to protect them from the sun's heat and the night's cold, ignoring each other, the piles of bodies lying around, the stench, the destruction ... and the three Americans who had destroyed their city and lives. The Americans, "thought it was just as well," William Craig wrote in his final words of his superb book: "The Fall of Japan." The scientists and specialists made their reports. The reports generated more reports, which generated more reports, which led to the big debate on nuclear weapons, their possession, their use and their development. As the Cold War heated up, there were more reports and reasons to debate, discuss, demonstrate and report further. One of the reports read, "Of all the urban services affected by bombing, housing is the most susceptible to quantitative statistical survey." Ultimately, the nuclear debate became one of the biggest issues in the world, which was deserved, because the stakes were the fate of the world. By the 1970s, when I was growing up, the bombs that fell on Hiroshima and Nagasaki were pygmies by the gargantuan standards of the United States and the Soviet Union. Both sides had more than enough weapons to incinerate the planet. Both sides periodically rattled them at each other to gain advantage in the Middle East or the Caribbean. Both sides periodically met over baize-covered tables in Switzerland or Vienna to find ways to reduce them, but didn't seem to come up with anything that really made a difference. But the topic and threat was endless, and Western society had something interesting and important to debate for five decades. Nuclear war even became a performing art, with Sam Waterston and Robert Prosky impersonating atomic arms negotiators in Broadway's "A Walk in the Woods," and Jason Robards gamely facing the nuclear devastation of Kansas City in television's "The Day After." The latter show was followed by an ABC televised round-table, with William Buckley, Robert McNamara and other talking heads debating nuclear weapons policy from the university stage in Lawrence, Kansas, which had just been destroyed by nuclear war and the special effects department. The politicos hammered at each other, and Nobel Laureate and Holocaust survivor Elie Wiesel was left to quietly pick up the pieces, emphasizing that nuclear war had made it possible to replicate the Holocaust in seconds instead of years. Everybody was a little quieter after that. There was an irony to me in the grand nuclear debate, as it rolled on over the decades. Hiroshima got all the attention. Hiroshima was the word used at rallies, debates and speeches. It was hurled on TV shows, movies and documentaries. Every year, as Aug. 6 rolls round, Hiroshima dominates the airwaves (between shark attacks and Paris Hilton's love life). We see the "atomic dome," the frail survivors, the equally frail American veterans, the grainy and horrific black-and-white footage, and the ceremonies in Hiroshima. They hold mass rallies there every year. Famous musicians sing about world peace. Anti-nuclear activists demonstrate. They sing songs, perform dances and act out skits. They block entrances to nuclear missile silos and nuclear power plants. It's all about Hiroshima. Nothing about Nagasaki. I've found many books about Hiroshima and the Manhattan Project. Everyone who had something to do with building or dropping the bomb on Hiroshima seems to have written about it. Everyone who survived Hiroshima has talked about it. Every reporter who went to that city after the attack wrote about it, too. It was and is a story that needs to be told, but there's no way to tell it. The most notable book was John Hersey's "Hiroshima," which described the destruction from six points of view. It took up an entire issue of "The New Yorker" in 1946, and shocked every reader. More than any other account of the atomic attacks, it made people realize that the A-bomb was not just another explosive, not just another weapon. But they were all about Hiroshima. I've found three books about Nagasaki, and I have two of them. One of them is bluntly titled, "The Forgotten Bomb." That's the book I don't have. The other books are "War's End," by Sweeney, which is his memoir, and "The Fall of Japan," by William Craig, who deliberately focused on Nagasaki, and the book jacket bills the work as follows: "Here for the first time is the full story of the second and more powerful of those bombs." Probably so. The mission was certainly more dramatic than the Hiroshima flight. But nobody really remembers � except the few guys who bombed the city, and the thousands of people who survived the bombing. And their numbers are dropping fast. Sweeney himself died in 2004. That's what happens when you finish second. Nobody remembers. Meanwhile, Nagasaki shuffled into its future, slowly recovering over the decades from destruction and radiation. I got to see that future myself, in the parks, gardens, museums and memorials that are the chief attraction of that rebuilt city. Most of Nagasaki's historic buildings were well south of the Urakami Valley, and still stand � the old British Consulate, for example, is now an art gallery. The downtown is a busy shopping mall, the factories and shipyards produced Japan's newest class of warships � a proud copy of the American "Burke"-class destroyers, which bear the names of Japanese battleships that fought in World War II. But in the Urakami Valley stand the memorials. Most are Japanese, of course, honoring their own dead. A giant Buddha-like statue points into the sky and casts a blessing on the world on the site of the Urakami Jail. The exact spot where the bomb detonated is marked by a black obelisk, surrounded by the paper cranes the Japanese fold to honor victims of atomic and other tragedies. Near that are pieces of buildings twisted, blackened, and ruined by the bomb. The Urakami Cathedral is restored, too, but the original tower lies on its side next to the canal where Fat Man hurled it. The Japanese also built and recently re-built a museum on the attack, where all the exhibits are copyrighted, so you can't take photographs of them; you have to buy the souvenir book. Profit out of misery, I guess. The exhibits are chilling � bones fused with dirt, melted bottles and shredded clothing. In the park near the Buddha-figure stand statues from various nations, honoring the dead. They're mostly the same: screaming neo-Socialist mothers protecting frightened children from the blast. They're mostly from the same place � the Soviet Union and her former puppet states: East Germany, Czechoslovakia, Poland, and so on. They're all from the same time: the height of the Cold War. They all say the same subtle message: Americans stink, the Soviets and their allies love people and peace. But those nations are all out of business. Only the statues and memorials remain, sending a mixed message to posterity. There are no Western memorials in Nagasaki, either. No foreign memorials in Hiroshima at all. I noticed that. The nearest things to a Western memorial in Nagasaki are plaques from Brazil and Turkey. No British, American, Australian, New Zealand or Canadian memorials. They don't honor Nagasaki's dead for a simple reason: Nagasaki was the home of the bad guys in that war. The objective of bombing Nagasaki was to end the war and get Jack Madison home. Along with other POWs starving in Japanese captivity: Jim Devereux from Wake, Pappy Boyington from the Solomons, Jonathan Wainwright from the Philippines, Christopher Maltby from Hong Kong and Arthur Percival from Singapore. Many of the men they commanded were dead or dying themselves, killed in battle or as POWs, or tortured and starved by their guards. 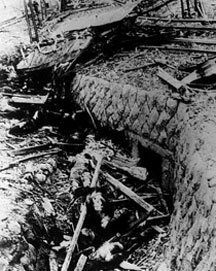 The Americans and British wanted to honor the POWs and men who fought on Bataan and Saipan, not the residents of Nagasaki. I could see their point. I also saw another point, in Britain, New Zealand and the United States. These nations have their share of war memorials, and most of them were propped up right after the Great War. In the British Empire and the United States, they are usually cenotaphs, with flags, bronze soldiers standing guard, lists of names, with the usual words about the "supreme sacrifice" in the "Great War of 1914-1918." Often they contain a list of the local guys who died at St. Mihiel or Ypres. They're often huge, massive, and built with the importance attached to what is hoped to be the last such memorial. After all, World War I was the "war to end all wars." It's only when you look closely that you see something interesting. The First World War gets all the stirring stone oratory. The Second World War just gets a more fleeting mention, usually on the steps of the monument. As an addition. The British monuments are engraved: "And Also 1939-1945" beneath the older letters. The Americans will say "And in World War II." World War II was the bigger war. It led humanity to the nuclear arms race and gave us the ability to destroy ourselves in a few blasts, some bright flashes, and a short time. It re-defined our planet in ways we are still living, enduring, and measuring. But it gets second billing on the stone memorials. After all, it was just the "second" World War. Great Pacific War is back in stock! David H. Lippman, an award-winning journalist and graduate of the New School for Social Research, has written many magazine articles about World War II. He maintains the World War II Plus 55 web site and works as a public information officer for the city of Newark, N.J.